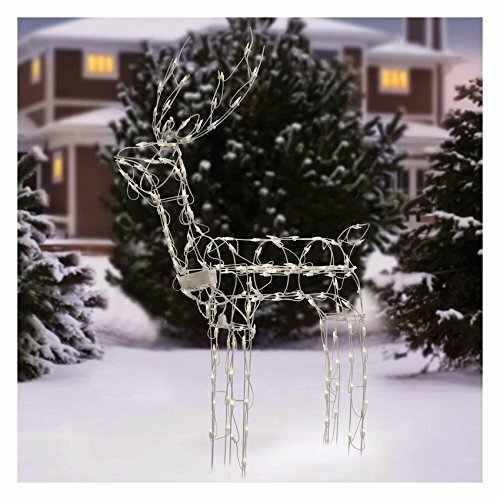 Light up your yard in style with this 3D Animated Standing Buck. It is 48 inches tall with 150 clear incandescent lights on a white wire frame. This animated buck moves its head from side to side. It is designed for indoor or outdoor use. Show off your home or yard to your friends and neighbors with this gorgeous standing buck! 150 clear mini lights with 1,000-hour bulb life. UL listed. Lights are pre-attached to the frame. Replacement bulbs and fuses included. Easy assembly and collapsible construction for easy storage. Animated head with horizontal, left-to-right movement. Durable, 1 piece, pre-wired metal frame. Rust resistant coated wire. Animated light-up buck is a 48" tall light sculpture. Indoor or Outdoor use. If you have any questions about this product by Holdiay Time, contact us by completing and submitting the form below. If you are looking for a specif part number, please include it with your message.